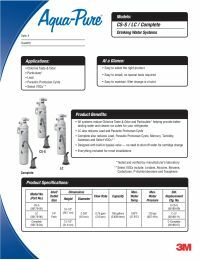 The AP Easy CS-S Drinking Water System is an under the sink single cartridge system that utilizes a sanitary quick change design with a long reach chrome faucet. The Aqua-Pure LC System reduces Chlorine Taste & Odor and Sediment, . Built-in Bypass Valve - No need to shut off water for cartridge change.